Burgers are rapidly evolving from being a quick on-the-go sandwich to becoming an exciting gastronomic meal out. Brighton & Hove alone has dozens of burger bars and restaurants popping up, all giving their own take on the burger-and-bread combination. The city has a new challenger for those of you on your quest to find the best burger. 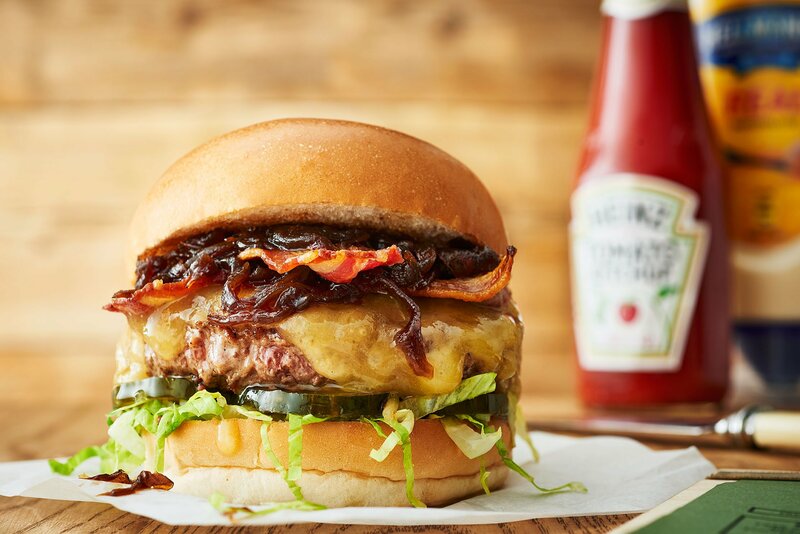 Honest Burgers promises an authentic food experience, specialising each restaurant to their location for collaborations with independent breweries and to utilise local ingredients. The two-floor restaurant was bustling when we arrived for a Thursday early evening sitting. Consulting the drinks menu, I ordered a large ‘Botanic Garden’ cocktail (£6.95, £9), a gin-based drink, which arrived in a glass so large it almost resembled a plant pot! The second cocktail on offer was ‘Tuaca Mule’ (£6.95, £9), a sharp drink served in a stylish copper mug. This is the Brighton adaption of the brand’s ‘Tiki Mule’ available at their other sites. For fans of locally-brewed beers, the restaurant also offers their very own speciality oat meal pale ale made with Holler Brewery on Elder Place. The restaurant’s ‘Honest’ beef burger was served pink (£11.50), how they serve their beef unless otherwise requested. The meat is also chopped instead of minced for flavour impact. This burger came layered with smoked bacon, cheddar, red onion relish, pickles and lettuce. The pickles were thinly sliced, and the chutney had a mellow sweetness as to not dominate each mouthful. These days it seems to be a rarity when a burger is already accompanied with chips. To our delight the burgers both arrived with a mountain of the restaurant’s iconic rosemary salted chips. When the boys first started serving these burgers at the Brighton Food Festival almost a decade ago, they ran out of chips on the first day. I can see why. Honest Burgers’ chips were incredibly crisp, with the rosemary keeping it fresh in flavour. Despite the feast already placed in front of us (which both of us could not finish), we had to test some of the long list of sides. I went for the onion rings (£4), which were enormous and coated in a thick, crispy batter. This married well with the chipotle slaw (£3.50), a slightly spiced version of the popular side dish. Opening its doors in February earlier this year, Brighton’s branch of Honest Burgers sits in the heart of the city on Duke Street. The restaurants are fronted by Tom Barton and Philip Eeles, who came up with the idea when they met working at Brighton’s Riddle and Finns. After they took their burgers to London, the pair have met great success. The brand now has 30 sites located across the city and in Reading, Bristol, Cambridge and Brighton. You will certainly need a healthy appetite to enjoy Honest Burgers to its fullest. 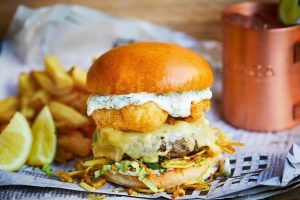 This luxurious burger joint won’t break the bank and will certainly be a strong contender to rival Brighton’s existing affluent burger scene.